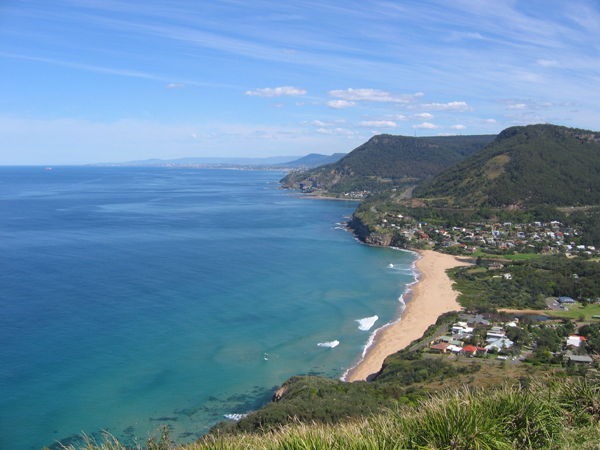 Took a long rode trip to Wollongong south of Sydney. Total trip on scoot was 80+km. Stopped for some nice scenic views of the coastline. Chatted with some of the other bikers and scooterists that happened to be doing the same thing I was. The entire ride was great but I noticed some cramping of the wrists by the time I got back to Sydney. Celebrated Labor Day back in the States a day early on Sunday. Spent all day Monday getting caught up with regular chores, etc. Sad note: Steve Irwin of the Croc-Hunter fame died today in a snokeling incident near the Great Barrier reef. Article in The Age. with all the talk of Samuel L. Jackson's new movie, Snakes on a plane, becoming the next cult movie, I had to go see it with some friends. Of course, we had to eat and drink beforehand. The drinks were more for the movie.. And before I hear about drinking and scooter riding, don't worry, I actually rode the ferry to get to the city and back home. The movie was good, not great. But I still had fun with the almost packed theater in attendance. The only thing I could have done without was the guy in front of me playing with his cell phone the entire night. Not usually a problem but he kept holding it up to text and send pics. So I got blasted by the display ever 5 minutes which was a distraction I could have done without. Back to the movie, SoaP was what I expected, lots of snakes, bad acting and all the one liners you could repeat to your heart content and your friends dismay. I had a good time and would tell others to do the same if you were looking for a night of mindless action and suspensed disbelief. Got my new scooter jacket. I'll post a pic when I get a chance. It's a lot cooler to ride in now. And I don't have to feel like a homeless person walking around in my winter one. Finally got the security chain I've been waiting for for 2 months. It was a nightmare to get it shipped here. Not that I've had to use it but it will come in handy when I do have to lock down the scooter somewhere. Work has been dragging by slowly. Mostly because of all the changes in staff. Lost several friends over the last couple months and have made some new ones. Played paintball last weekend after 16 years had past since I put down my last gun. That seemed like yesterday. Had a great time and was surprised by how many Aussie girls turned out to play. About 4 of us headed to Windsor north of Sydney abut an hour Saturday. We were included in a group of about 40 people for the morning. We played for around 5 hours and had lunch afterwards. Several painted bodies later, we headed for home. The official bid list came out earlier this week, which means I'm looking at new homes for my next tour starting near the end of 2007. I've been a bit busy but have been checking out my options on what's available. There's about 200 choices for me to pick from. I'll let you know more after I get my list submitted. It's always a time of hopeful anticipation. Each new post seems to bring a world of possiblities. I know I won't be planning on a small Embassy or Consulate anytime soon. After 3 years of wearing every hat I could, I'd like to focus more on my own job or at least get a chance to. My advice to others, watch out for any post that only has a couple people in your section. Depending on the size of the office, you'll probably be doing your job and 3 others during most of the tour when someone is away for training or on holiday. I made the choice to save most of my time off for the holidays at the end of the year. It's ok but you get a bit burnout covering for everyone all year long while they're gone for a month at a time.